They agree that the attempt by some of their countrymen to obtain Aadhaar and other cards meant for Indian citizens is wrong. Rohingya refugees living here have appealed to the Indian government to mount pressure on Myanmar to create conditions conducive for their safe return. Worried over reports that India may deport them, the refugees said they would return on their own once assured safety. They also want Myanmar to grant them citizenship and return their lands. The deportation of seven Rohingya Muslims earlier this month has left refugees across Indian cities worried. The seven Rohingya, who were held in a Assam jail since 2012 for illegally entering India, were handed over to the Myanmar government after the Supreme Court turned down a plea to stop the government from deporting them. The deportation prompted UN High Commissioner for Refugees (Unhcr) to remind New Delhi that the international laws required nations to refrain from sending refugees back to countries where they could still face danger. About 18,000 Rohingya refugees registered with Unhcr are living in India. Of them, 4,000 of them have found a home in Hyderabad. 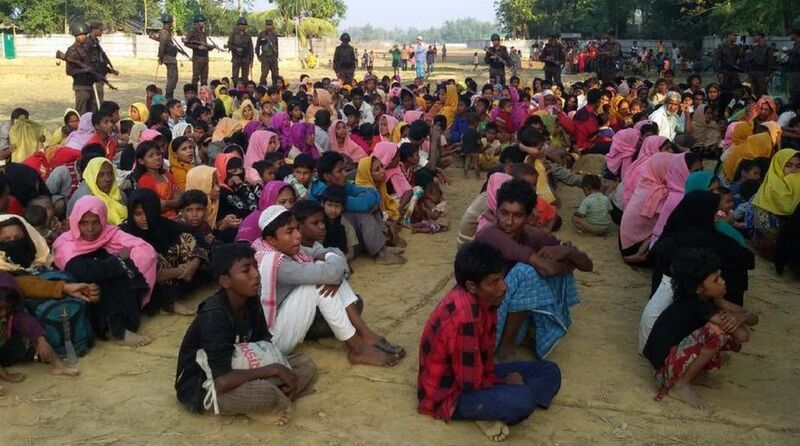 About a million Rohingya reported to have fled Myanmar to escape persecution by armed forces. Majority of them have taken refuge in Bangladesh. While thanking the Indian government for allowing them to live all these years, the refugees appealed to the government not to turn them back as they still face danger to their lives in Myanmar. “Don’t send us back. Instead, bomb us here. At least we will have graves here. We don’t even get a burial there,” said Sultan Mahmood, one of the refugees, told IANS. He recalls how they fled to escape persecution in Myanmar’s Rakhine state and landed up here. “We have seen them butchering many people and setting our houses on fire. That memory still haunts us. We shudder to even think of going back there,” Sultan, who came to India with his wife and two children including 19-year-old physically handicapped, who is completely bed-ridden. “Peace has not been restored there. How can we go back?” asks another refugee, Haroon Mohammed Idris, who along with his wife and four children arrived in India in 2012. Haroon, who lost 20 members of his family including parents, siblings in the crackdown by Myanmar’s armed forces, said if sent back they would also meet the same fate. Sitting in the dirty surroundings in refugee a habitation of small huts in Balapur, 80-year-old Ameer Hussain is worried over the future of his six-member family. With his 32-year-old son in custody of Myanmar authorities for 13 years, he has no earning member in the family. The local police visit the refugee camps and check their cards. “We extend all our cooperation because we are neither terrorists nor criminals,” said Ameer. “We appeal every day not to indulge in such illegal activity,” said Bilal Hussain, who is incharge of the camp at Balapur, one of the 25 refugee camps in the old city of Hyderabad.